If you're traveling to Kansas City, Missouri between Thanksgiving and New Year's Day, you won't want to miss visiting one of the many Christmas lights displays in the area. 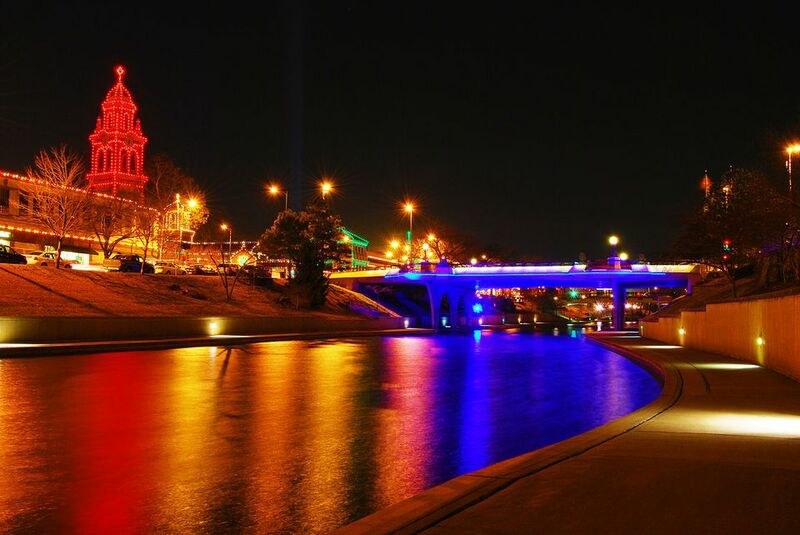 From the famed Plaza Lights and holiday displays of Kansas City to a house whose lights dance to holiday music, you'll find it all in Kansas City this Christmas season. Along with hosting a slew of special Christmas events and lighting ceremonies for these brilliant displays, Kansas City boasts one of the largest city lighting projects in the country, covering the whole of the shopping district known as the Country Club Plaza with over a quarter million lights that visitors can wander through at leisure from late November through early January. In addition, many of these lighting displays also feature Santa's Workshops and Winter Wonderlands where families can stop off after a drive through the lights to visit Santa and Mrs. Claus in replicated North Pole villages. Discover more about these special seasonal displays so you can plan your Christmas vacation to Kansas City. Perhaps the biggest draw for holiday tourists to Kansas City is the brilliant Plaza Lights display at the Country Club Plaza, which has illuminated the shopping district of the city for over 80 years. The lighting display clicks on at an official opening event on Thanksgiving evening and features over 280,000 bulbs on 80 miles of lighting rope that adorn the Spanish-style buildings of the district. Visitors to the Country Club Plaza can expect to find deals on Christmas shopping, fine dining opportunities, and even a carriage ride while wandering through the district; sponsored and installed by the Kansas City Power and Light Company each year, the annual Plaza Lights celebration was first held in 1930. The Country Club Plaza features dozens of shops, several hotels, a few fine dining establishments, and a slew of moderately priced restaurants and bars. While you wait for the lights to flip on, walk down the Spanish-inspired streets and take in all that this shopping district has to offer. The 89th Annual KCP&L Plaza Lighting Ceremony will be held Thanksgiving night with the pre-show beginning at 5 p.m. The lights shine nightly through January 13, 2019. Since its introduction in 2009, The Legends Outlets at Village West Shopping District wows audiences each year with their "Legendary Light Show," the first public display synchronized to holiday music; the show runs every evening from 5 to 10 p.m. at 15-minute intervals and kicks off with the annual ​​Tree Lighting Ceremony on November 17, 2018, from 6 p.m. to 8 p.m. There are a number of privately owned homes that also move to music during the holidays, so it's definitely worth driving around some of the Kansas City suburbs to find these hidden lighting displays, tune your radio to a special station, and watch the lights dance to music. Consider stopping by the Downtown Marriot at 200 West 12th Street, too, for an extra-special changing display. You can also check out Christmas Card Lane in Olathe, Kansas, which features over 200 homes adorned with lights and holiday cutouts and displays, or the Candy Cane Lane in Prairie View, Kansas, which saw a resurgence in popularity after its 50th anniversary in 2007. The neighborhood has participated in this event for over 60 years. Christmas in the Park and Paulie's Penguin Playground area also great installations set up each year. Head over to Longview Lake's Christmas in the Park for one of Jackson County Parks and Recreation's most celebrated events of the year features over 175 animated figures and 300,000 lights you can drive through and enjoy.